Heat oil in a pan and add the panch phoron. When it splutters add the ginger paste along with the garlic and green chillies. Add the chopped onions immediately and sauté well until they are soft. Add chilli, turmeric and coriander powders. Toss in the chopped tomatoes and cook covered for 5 minutes. Then add the cooked potatoes (I mashed some of the cubes) and cook for 3-4 minutes. Add some water to get a gravy-like consistency. Continue cooking for 2-3 minutes to allow all the flavors to blend. Serve hot with rice or chapatis. I had mine with some steaming hot rice, pappad pickle and yogurt. It was so simple to prepare but oh-so- good! I wonder why I have never prepared anything like this before. I know I probably should have used mustard oil instead of the regular vegetable oil but I had a feeling that it would not be agreeable to our South Indian palate. The panch phoran lends an incredibly unique fragrance and flavor to the dish. It was so good that we did not have any left over for the next day. This is my entry for RCI: Cuisine of Bihar being hosted by Sangeeta of Ghar Ka Khana. This recipe is also going to SRA for her event, Grindless Gravies. Many thanks to all those food bloggers who take time out of their busy schedules to host and put together these fun-filled events, and in the process help bring new tastes and flavors into my kitchen. Aloo in any form is yummy :). Very delish looking curry, TBC! Looks so nice. I should try this sometime. Hiya.. Hope you had a wonderful Thanksgiving holiday. I didn't think I could stay away from food blogs for this long but had no time the past few days. Your Aloo Masaledar looks lovely. I've been wanting to cook with panch phoran ... What a lovely combination with pickle, papad and yogurt - mouthwatering. Hi TBC, thanks for this entry. I will make this soon. We get something that looks a bit like this in our cafeteria but without the panch phoron. 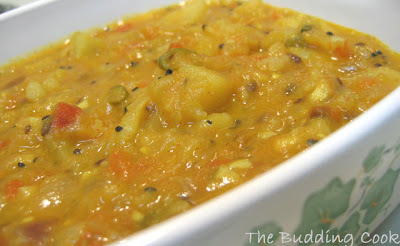 wow...another yummy recipe with aloo.. This is an awesome gravy recipe! Sounds really similar to the potato masala we often have with dosas. Nice one!! Aloo is an all time favorite of u'rs! This curry goes well with Poori too. Colourful Curry, thanks for sharing. I don't know this dish, but looking at the ingredient list I know I would love it! that bowl of subzi looks so good, d-lish!! Haven't heard of this..looks like very yummy dish.Liked the pasta salad too..
Sure does look Rasedaar to me! yummy!! Looks very nice!! I love panch phoron tadka!! its unique flavor is such a change, isn't it!!? Looks so delicious. Panch Poran is new to me. Never tried it before. Nice entry for both the events. Perfect for these cold days. looks gr8!! nice version...will try it. Hey TBC, This is very similar to my 'Masaledaar Aloo ki Sabji' entry to Grindless Gravies event. I use nigella seeds in mine which is a part of the panch phoron. I guess the difference between Uttar Pradesh and Bihari cuisine is that in Uttar pradesh authentic daily cuisine, use of garlic and onions is minimum. But glad to visit you blog. I made this a couple of days ago, and it is SO good. Thank you for posting this recipe. I am definitely going to be making this regularly.